Did you know Santa Rosa once had an art school? It's right there in the "Illustrated Portfolio of Santa Rosa and Vicinity," a 1909 book put together by the Chamber of Commerce and the Press Democrat to promote the town. Granted, the school didn't get beyond the planning stage and the building was never constructed, but hey, Santa Rosa needed something to show that it could become a classy place. By 1909, the pace of change in Santa Rosa was accelerating. The last of the post-earthquake reconstruction was finishing up and the town's administrators finally closed the tenderloin district after 30 years. There were now three theaters downtown and almost all of the main streets were asphalt paved. In this burgeoning little metropolis the art school would have fit right in. 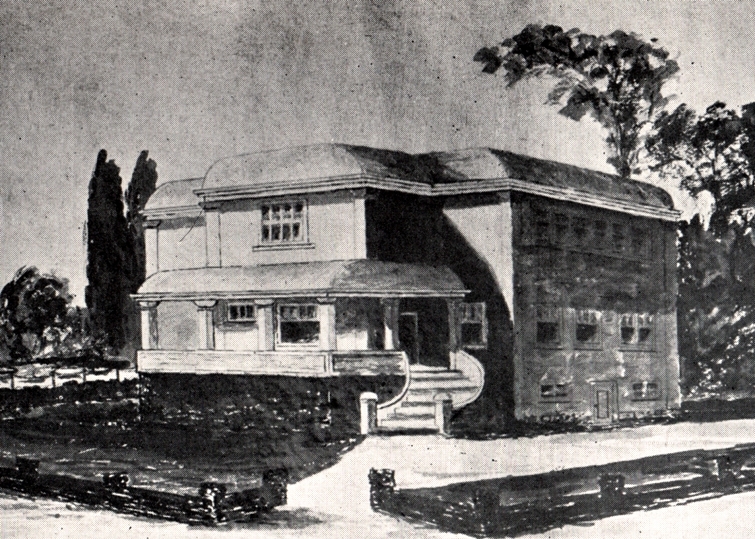 Located on College Avenue near the current location of the Mission Car Wash, the plans for the school show a very modern design; in some ways it anticipated the streamlined Art Deco style of a quarter-century later, with its rounded corners on the roof above triple-row horizontal banding. The force behind the planned art school was S. T. Daken, a landscape painter who was in Sonoma County for five years after the 1906 earthquake, living in Glen Ellen near his friend Jack London until he and his family moved to Santa Rosa in 1909. Here he taught art at the Ursuline College and at his studio at 509A Fourth Street, today the location of a pawn shop. Daken's time in the county has been recently described in a pair of very interesting articles in the Sonoma Historian, the quarterly newsletter from the Sonoma County Historical Society. The author, Tilden Daken's granddaughter, has a web site devoted to her ancestor, and also in the newsletter tells the tale of Daken and London meeting in a hayloft, the pair of them then hopping trains and riding the rods underneath boxcars from Reno to San Francisco. The art institute project floundered for almost two years before it was abandoned, apparently due to Daken's rocky personal finances and inability to find enough investors. His partner in the development plans was local contractor Frank Sullivan, with whom he had other dealings in 1909. Together with Daken's former landlord, Dr. C. C. O'Donnell, they were hornswoggled by a con man who supposedly planned to build a world-class sanitarium for alcoholics in Glen Ellen. Sullivan and O'Donnell both were scammed, but when he tried to sweet talk Daken into painting a 12-foot canvas, the artist wisely refrained from putting brush to canvas until a deposit was forthcoming - which, of course, it never was. Both Santa Rosa newspapers wrote of the art school as if it were a fait accompli, and the article transcribed below waxes poetic on the glory of painting local sunsets. Had the place actually been built, students trying to capture twilight's last gleaming from the studios would have certainly kept school's westward windows shut, as it was a block away and downwind from the slaughterhouse. Obl. believe-it-or-not footnote: The item from the Santa Rosa Republican included a snippet of poetry using a word that can't be found in any dictionary: "Trancid," which apparently was a mashup between "tranquil" and "placid." A search of Google Books shows that it was in use from at least 1856 to 1942, but not even the Oxford English Dictionary mentions it. The word most often appears in obscure verse and poetry; really bad poets seemed drawn to it as moth to flame. Santa Rosa is seen to have what few towns of its size can boast--an art school and art gallery. S. T. Daken, the artist, has had plans prepared by J. B. Durand for a building to be devoted to these purposes. It will be located on the corner of College avenue and Ripley streets, and, judging from the plans, will be a decidedly attractive structure. The style of architecture is along simple, dignified lines and the exterior finish will be something unique in rough cast cement plaster. The building will be a two story and basement heated by a furnace. The first story will be devoted to living rooms, and the entire second floor will be used for class room and gallery purposes. Special attention has been paid to the lighting facilities for the benefit of the art students as well as to show the paintings in the gallery to advantage. Besides Mr. Daken's private collection of the works of noted artists, and his own paintings, which will form a permanent display in the gallery, the American Art Association, with which the Daken school will be affiliated, will furnish at various times excellent examples of art, including sculpture and architecture, as well as paintings. This association, whose headquarters are in New York, supplies circulating collections to affiliated schools throughout the United States. An art library will be at the disposal of the students and lectures by well known artists will be given at frequent intervals. These, with the affiliation mentioned, cannot but be of great advantage to the students. The course will include studio work from models and sketching classes. In the vicinity of Santa Rosa are many beautiful landscapes, and the cloud effects are especially fine. There are sunsets of exceeding grandeur when the dying rays gleam on St. Helena's snowy crest, throwing over the dark canyons of the eastern mountains yet darker shadows, and there is beauty too. The circuit of the hills." This city is indeed a fitting location for such an Art School as Mr. Daken purposes to found and there is every reason to believe that the institution will be highly successful. The construction of the building will be under the supervision of Mr. Durand and work will be commenced as soon as possible after he recovers his health sufficiently to attend to business. Artist S. T. Daken of this city is the only man who was shrewd enough to prevent being "taken in" by Dr. F. Harry Williams, who was also an attorney. Williams, it will be remembered, is the man who came here and purported to purchase the O'Donnell ranch at Glen Ellen for a huge Emanuel [sic] Sanitarium. After letting contracts with lavish hand and transacting all kinds of business without parting with any coin, Williams determined that he wanted a huge landscape scene of the sanitarium, showing San Francisco bay in the distance, to place on exhibition at the Seattle exposition. He consulted with Artist Daken and ordered from the latter an oil painting six by twelve feet, showing the sanitarium. In accordance with this order Artist Dakin went over to Glen Ellen and made the preliminary sketches from which to paint the scene, and forwarded these to Williams' address in the metropolis. In the letters to Williams Mr. Daken informed him that if he wished the work to proceed he would have to enclose a remittance in the return letter as a deposit on the same. The picture was one that would have had little commercial value to Artist Dakin had it not been accepted by Williams, and he proposed to take no chances with the man, who was an entire stranger to him. From this it will be seen that in addition to being an artist of renown, Daken possesses the faculty to read human nature in a far greater degree than some other Santa Rasans [sic], who are mourning the time and money lost on Williams.